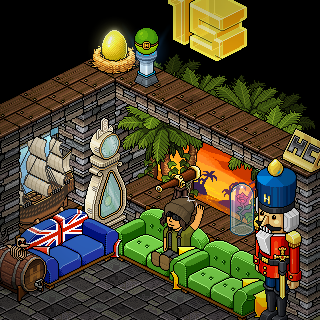 This Habbo's well on his way to becoming a fashion legend! Runway 2010. This group badge represents Habbos that have good knowledge in trading. Badge can only be obtained after fully proven. A group room discussion of Malaysian Room Designer to brainstorm all the ideas of the room design. 3, 2, 1, GO! Wobble Squabble returns with a bang. Welcome To Army Corporation. This Company Was Founded On 04 April 2008. Where People Becomes Best Friend. Treat other people like how you want to be treated. come if u nid it! ~still can't find the cure! 7 worriors graveyard.. + ghost! Obey to habbo rules!Play nice! Daze Jones ship crew lost in Seven Seas..nobody knows where they are now..
its a secret..so don't ask me anything! ~no need flux capasitor anymore! Please don't disturb this ancient Sea Monster..
~i served for my country..did u? ~created during Worldwide Mute period on June 2012. By completing quests every day you will earn 'Snowflakes'. Snowflakes allow you to choose free gifts from the Catalog. Its only available during Xmas 2010 event. This is the place wheres the Zephyr team start their journey. Make sure your kitchen always clean n clear from any bacteria. Music n Movie Hangout Room. Taken in this room on 17 January 2019 and received 1 likes. Taken in this room on 24 July 2018 and received 4 likes. Taken in this room on 10 December 2017 and received 2 likes. Taken in this room on 1 December 2017 and received 2 likes. Taken in this room on 5 November 2017 and received 1 likes. Taken in this room on 9 February 2016 and received 0 likes. Taken in this room on 14 December 2015 and received 1 likes. Taken in this room on 7 December 2015 and received 0 likes. Taken in this room on 10 November 2015 and received 2 likes. Taken in this room on 19 October 2015 and received 3 likes. Taken in this room on 8 September 2015 and received 2 likes. Taken in this room on 8 September 2015 and received 1 likes. Taken in this room on 29 August 2015 and received 3 likes. Taken in this room on 30 July 2015 and received 2 likes. Taken in this room on 30 July 2015 and received 1 likes. Taken in this room on 29 July 2015 and received 1 likes. Taken in this room on 27 July 2015 and received 1 likes. Taken in this room on 25 July 2015 and received 2 likes. Taken in this room on 2 July 2015 and received 4 likes. Taken in this room on 2 July 2015 and received 2 likes.